Reasons for observing in space has already been covered in Space Observatories so I will not repeat it here. 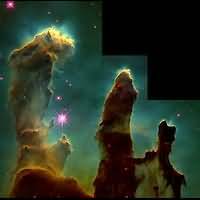 What will be mentioned here is the breakthrough observations of the Hubble Space Telescope. The "un-official" Hubble Space Telescope website is a good visit. 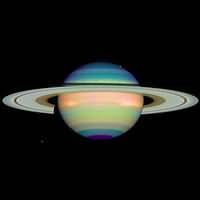 Also of interest in a website full of obscure facts and information on space exploration - AeroSpaceGuide. For your dose of Hubble News, visit the HubbleSite News Center. Much of our ideas of a wide variety of phenomenon have been reshaped thanks to this remarkable telescope. The success is mainly due to lack of atmospheric interference - the bane of astrophotographers here on Earth. Sure the adaptive optics breakthrough of the Keck telescopes have circumvented the atmospheric interference problem, but nothing beats removing that affect altogether. Because the Hubble is in space and does not suffer from daylight, some of the deepest and most dramatic photographs have been released. The Hubble Space Telescope concept was initially discussed back in 1960's and scientific proposals for the telescope was drafted in 1977. Original orbital insertion date of the telescope scheduled for 1983. Cost delays and the loss of the Space Shuttle Challenger in 1986 pushed back Hubble's orbital insertion to 1990. Original plans dictated an operation status of 15 years. The Hubble has been active for 14 years and is still running strong. Near Infrared Camera and Multi-Object Spectrometer - NICMOS: sees more heat than light, allows penetration of dust clouds within our galaxy. Because the Hubble Space Telescope is outside our Earth's atmosphere, the telescope and its instrumentation allow for a much larger portion of the EM-band to be studied. Each of the instruments onboard are specifically tuned for a specific region of the EM-band, but as a hole cover an area far greater than any traditional telescope on Earth. Hubble is in what is called a "low-Earth orbit," only 600km above the surface. One orbit of Hubble takes about 96 minutes. 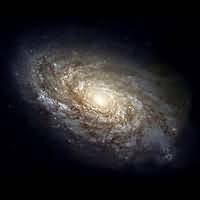 Additional information on the history and timeline of the Hubble can here found at the ESA's Hubble Space Telescope website. Possibly the greatest achievement of the Hubble telescope is the Hubble Deep Field. The latest deep field image was released on March 9, 2004. Every object is this image is a galaxy, some 10,000 of them. Over 800 exposures, 400 orbits, and a total exposure time of 11.3 days resulted in the deep field image on the right. This is an example of what a space based observatory can do. There have been 3 major Servicing Missions - or SM's - with a forth initially scheduled for January 2004. The loss of the Space Shuttle Columbia in February 2003 forced NASA to cancel that mission. 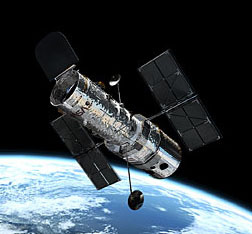 Although the public and scientific communities are angered by NASA's decision, it should be know that the Hubble, in its current state, is predicted to be operational until the years 2007 to 2008. Details of the Assessment report release in January 2005 can be found on the Hubble Space Telescope website. The successor to Hubble is the Next Generation Space Telescope - or NGST. Currently in its design stages, predicted launch is said to be around January 2008 - about the time the Hubble is predicted to shut down.